500 Days Of Film Reviews The Unmissable Movies In March! Well, here we are in March already. How that has happened is beyond me. However, 2018 has already given us a wealth of unmissable movies - Lady Bird, The Shape Of Water, Black Panther and Three Billboards Outside Ebbing, Missouri to name but four. The Movies To Watch In March 2018! A film that generated much buzz around the festival circuit, director Sebastián Lelio’s A Fantastic Woman tells the story of Marina (a much admired performance from Daniela Vega) as she comes to terms with the death of her partner. For me, a must see. Starring Jason Bateman, Rachel McAdams, and Kyle Chandler, Game Night - about a murder mystery party that goes a step too far - looks like a lot of fun. I'm not sure what to make of Nash Edgerton's Gringo. The film is being described as an "exhilarating mix of dark comedy, white-knuckle action and dramatic intrigue". So there's that. It also has an impressive cast (including David Oyelowo, Charlize Theron, Joel Edgerton, Thandie Newton and Sharlto Copley). As a result, I am most definitely intrigued. I am looking forward to Warwick Thornton's Australian western (starring Sam Neill and Bryan Brown) set on the Northern Territory frontier in the 1920s. Justice is put on trial when an aged Aboriginal farmhand shoots a white man in self defense and goes on the run as posse gathers to hunt him down. Lynne Ramsay is one of my favourite directors and I am so excited for You Were Never Really Here. I expect this movie (starring Joaquin Phoenix) about corruption, violence and a missing teenage girl to grip, unnerve and challenge me. Natalie Portman, Jennifer Jason Leigh, Tessa Thompson and Oscar Isaac) to hit Netflix. Another film that I am a tad wary of... however, I'm still looking forward to Tomb Raider because Alicia Vikander is such an impressive actor. Ready Player One looks like another spectacular adventure from legendary director, Steven Spielberg. Based on the book by Ernest Cline, the movie follows Wade Watts (Tye Sheridan) as he hunts for treasure within a virtual reality world called the Oasis. We’ve had to wait seven years, but March sees the release of Paddy Considine’s second (after the heartbreaking Tyrannosaur) feature film. Journeyman tells the story of boxer, Matty Burton, who suffers a serious head injury during a fight. What Films Do You Plan To See In March? 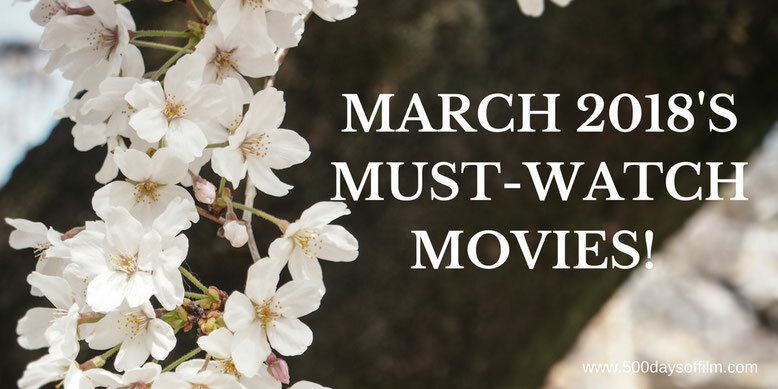 What movies are on your must-watch list for March? Let me know! Leave me a comment in the box below or via Facebook or Twitter (@500DaysOfFilm).